UNMATCHED LOCAL EXPERTISE. NATIONWIDE NETWORK. ONE SOURCE. The Land Advisors Organization specializes in the innovative brokerage of land and improved property through deep market insight and unparalleled service to owners and consumers of real estate. With an exclusive focus on land-related assets, we integrate comprehensive information, cutting-edge mapping technology and the knowledge and experience of highly specialized professionals to help our clients identify and capitalize on valuable opportunities in all kinds of economic environments. 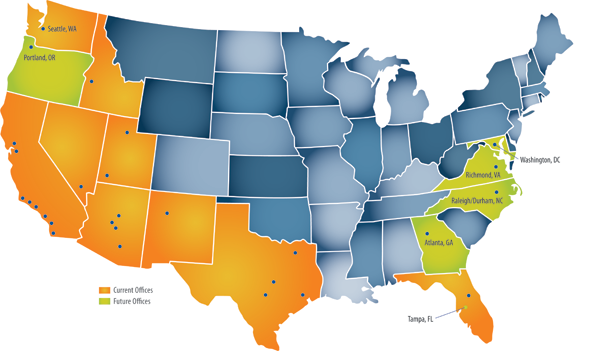 The Land Advisors Organization employs a true collaborative brokerage model with offices located in Arizona, California, Idaho, Nevada, New Mexico, Florida, Texas, Utah, and Washington.